After the race, the stewards decided to exclude the #100 Garage 59 McLaren 570S GT4 of Sandy Mitchell and Ciaran Haggerty from the meeting, and the Race 1 results after “causing an avoidable collisionafter chequered flag and driving in very unsportive manner”. The final results following the exclusion are available below. 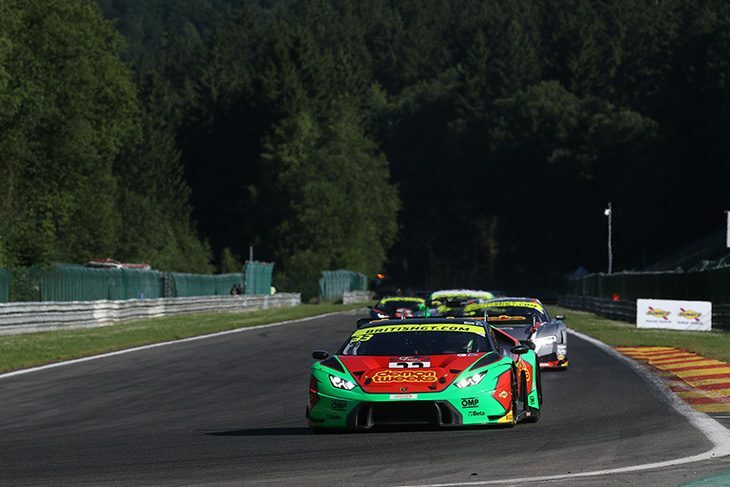 Phil Keen and Jon Minshaw scored their fourth win of the 2017 British GT season at Spa, extending their championship lead in the #33 Barwell Motorsport Lamborghini Huracan GT3, taking the lead halfway through the race at the round of stops. “That went pretty well really!” said Keen to DSC after the race. “Jon drove well and the Bentley had a pit stop penalty which have us a cushion, all I had to do after I got in was maintain the gap really. Second on the road was the Team WRT Audi R8 of Stuart Leonard and Alain Ferte 14 seconds back from Keen by the end of the race and just a single second ahead of the #39 Kessel Racing Ferrari of Carlo van Dam and Piti Bhirombhakdi. It was a good result for Kessel, which briefly led at the start after Bhirombhakdi took second at La Source from Jack Mitchell’s Macmillan Vantage and the lead from Rick Parfitt at Les Combes. 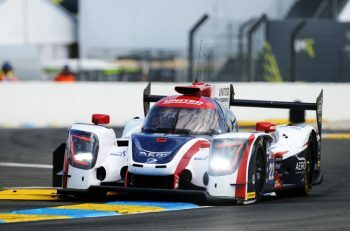 But it wouldn’t last, as Partiftt took back the lead as the first of two safety car periods started, which held the race under caution until the pit window. The first was for the Century Motorsport Ginetta G55 of Steve Fresle, which went into the barriers at Radillon hard on the first lap, and the second was for a collision between Nick Jones in the Team Parker Racing GT4 Porsche and Anna Walewska in the sister #111 Century Motorsport Ginetta at La Source as the race went green. The incident left the Porsche stranded atop the Ginetta and caused the safety car to come straight back out. Neither Ginetta will take the start in Race 2. When the race went green for a third time almost the entire field pitted, shaking up the order. Pit stop time penalties for the leading Parker Bentley relegated Seb Morris to sixth place, and promoted the WRT and Kessel cars to second and third. Morris then moved up to fifth by the end of the race, behind the sister #7 Team Parker Bentley of Callum Macleod and Ian Loggie that finished in fourth. That was the eventual finish order, with the field mostly spread out in the run to the flag. GT4 was far more dramatic. 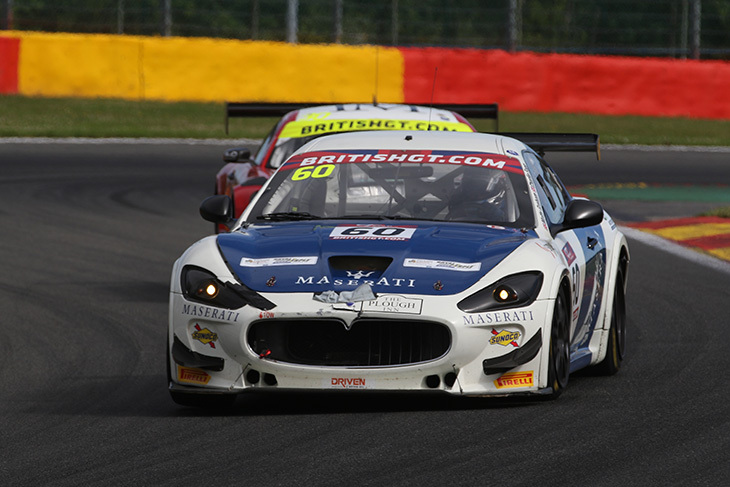 Eventually the Ebor GT Maserati of Matthew Graham and Charlie Fagg, which started on the back row after missing Qualifying fought its way through the field – benefiting from the safety car – to win the race after Graham make key overtakes in the final few laps. It was set to be a similar story for the Optimum Motorsport McLaren of Mike Robinson and Graham Johnson, which drove from the back of the field after they also missed Qualifying. Mike climbed as high as third and would have been in the race for the win, but he was tagged by Stuart Leonard in the WRT Audi, dropping it down to last due to the damage. “It was looking good, but I got hit by the Audi,” Robinson told DSC. “I’d already turned into the Bus Stop, and I felt the car go round and I looked into my mirror before the corner and he was overtaking the two Ginettas behind me. He was miles away, four of five car lengths back. In the end, second was taken by the #51 Lanan Racing Ginetta of Dave Pittard and Alex Reed, after Pittard took second off Stuart Middleton’s HHC Motorsport Ginetta on the final lap. It was a crucial result for the team, which has extended its GT4 points lead further heading into the final two races. “I wanted that so badly! Fair play to Stuart, he gave me lots of room, it was a fair race,” Pittard said. “Top job for him, and that made it such good race at the end. It was very even between us. The 2015 G55 is still lacking in a straight line, but made the most of the traffic to get back past him. All three podium sitters also benefitted from Tolman Motorsport’s McLaren suffering a puncture on the penultimate lap while Joe Osborne held a comfortable lead. It would have been a great win for him and David Pattison, after Osborne rose from seventh to first after a quicker stop. He was untouchable throughout his stint, but eventually finished 13th in the class following the issue. Off the podium was the #100 Garage 59 570S GT4, which as unlucky at the end of the race too. Sandy Mitchell stormed to the lead of the race at the start, getting past the HHC Ginetta of William Tregurtha, before Ciaran Haggerty climbed in and emerged second behind Osborne. But Haggerty struggled with tyre degradation at the end of his stint and slipped down the order to fourth. 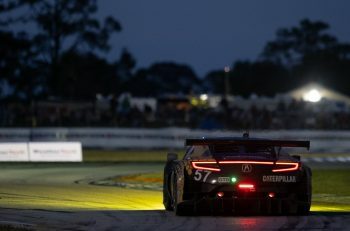 “Halfway through the stint the grip started to go away, so I had to try and keep the cars behind, but unfortunately the Maserati – which isn’t even in the championship – get by and it let the other cars through as well,” Haggerty explained. The #53 UltraTek Racing Team RJN Nissan completed the top five. Race 2 at Spa is set to begin at 13:00 local time in Belgium.